A family of four in Kentucky earning more than $24,250 a year has until midnight Sunday to sign up for health insurance to avoid a federal tax penalty. The penalty only applies to people who earn more than 100 percent of the federal poverty level, including those who are eligible for the Medicaid expansion. People who are eligible can sign up for Medicaid at any time. But everyone else has until midnight Sunday to purchase a qualified health plan through kynect, the state exchange, which could include a federal subsidy to lower your monthly premiums depending on your situation. Friday, people lined up outside of the kynect store at the Fayette Mall. Democratic Gov. 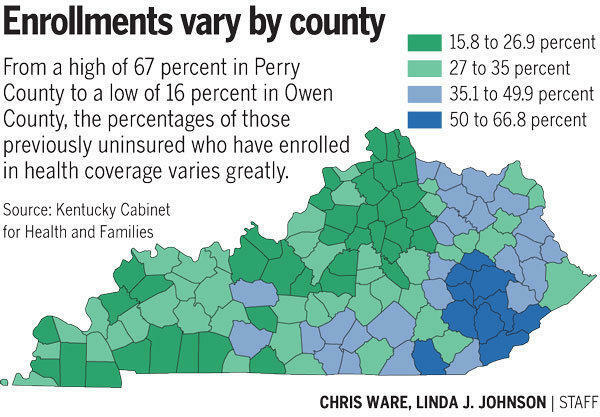 Steve Beshear said less than 12 percent of Kentuckians do not have insurance. Kentucky's health care exchange, kynect, has newly enrolled 3,000 people in health coverage the past three weeks, and the state says more than 114,000 Kentucky residents have enrolled or renewed plans since open enrollment began eight weeks ago. Tom Martin of the Lexington Herald Leader speaks with Margaret Levi, lawyer with the ­Lexington firm of Wyatt, Tarrant & Combs, and author of The Impact of Health Care Reform on Kentucky ­Employers, a 68-page booklet published by the Kentucky Chamber of Commerce. Kynect.Ky.gov is the tool Kentuckians have used to sign up for health insurance, but in Eastern Kentucky an old fashioned, boots-on-the-ground outreach — in restaurants, cash advance businesses, and churches — appears to be key to getting people to use the website. Since open enrollment began Oct. 1, more than 231,367 Kentuckians have enrolled in health insurance made available through the Affordable Care Act.